Eating is one of the joys of life and tasting various cuisines from around the world is privilege not everyone gets to experience. Nothing compares to the experience of eating them in their local country: Greek salad in Greece, Spanish paella in Spain, gorging on sushi in Japan, and authentic Australian barbecue and catering in the land down under. However, the world’s cuisine isn’t only tasty: food from different countries can leave you asking “how can they eat that stuff?” regardless of where you’re from and your cultural background. Without further adieu, let’s take at some of the world’s exotically weirdest foods. Yep, it’s still moving although it had its brains removed. But still, it looks and acts alive – just look at trying to escape as you pour soy sauce all over it. If you plan to eat this (why the heck not? ), just be sure to chew on it thoroughly, mainly because the dead octopus can lodge itself on your throat and replace your nervous system. Just kidding, it’ll choke you to death. Why it’s good: The act of unconsciously trying to suffocate you is a guarantee that it’s FRESH. So yeah, it’s definitely one of the world’s weirdest foods. Cheese is a gift from the gods of food: we can’t exactly picture eating biscuits and burgers without them, right? But hey, one of the weirdest foods in the world is a kind of cheese. If you live in the island of Sardinia in Italy, you’re better off eating the biscuits alone and say no to it. Why? Well, there’s a particular type of cheese in the island which contains live maggots. 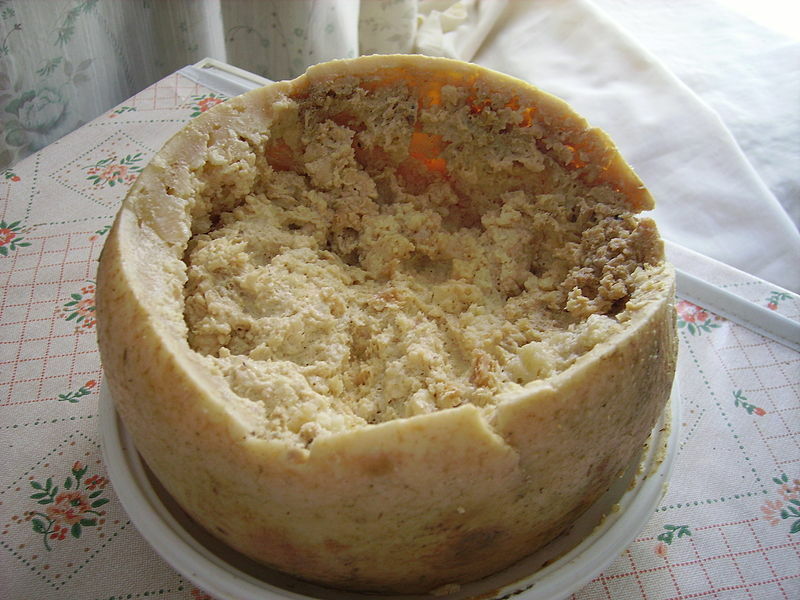 A stinking glob of Casu Marzu. Photo from Shardan. Yes, maggots. As in fly larvae. Ladies and gents, this cheese is the Casu marzu, a traditional sheep milk cheese. Basically, it’s made by leaving pecorino cheese outside with a rind removed in order to DELIBERATELY make the flies introduce their eggs into the cheese. The cheese is actually very soft, given that the maggots break down the cheese’s fats and it people who have eaten swear that it melts in your mouth. Maggots are soft too, you know? Though just be sure to hold your hand up since they can perform six inch jumps! However, it’s deemed illegal by the European Union so you’ll have to get some (why would you?) in the black market. Why it’s good: It has a strong flavor which leaves a strong aftertaste lasting for several hours which guarantees that you won’t be in the mood to eat for a while. What is the best way to beat arachnophobia? Being one myself, I don’t have any clues but you could try eating fried spiders. 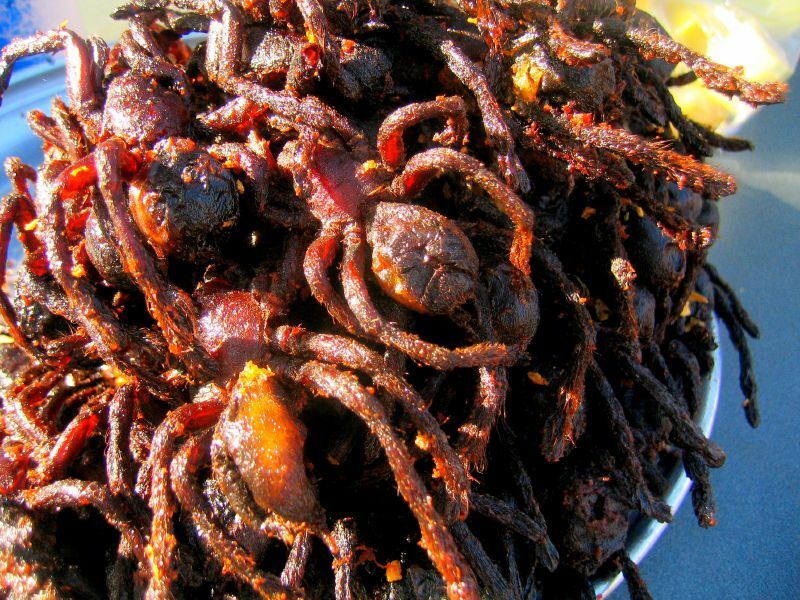 Yes, you read that right: fried spiders from Cambodia. Southeast Asia’s cuisine is mind-boggling, and the ones belonging to this Indochinese country. This dish is deep fried in garlic oil until its texture is like that of chicken skin. Its innards however, are said to be gooey and soft on the inside. Although we can agree that it’s one of the weirdest foods out there, it actually saved a lot of people. 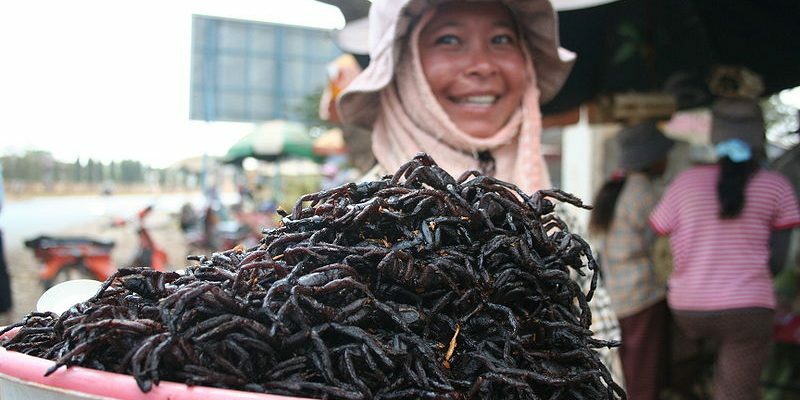 During the reign of the brutal Khmer Rouge in the 70s, the starving population had to look for alternative food sources, leaving them no choice but to eat spiders. Why it’s good: It’s rich with protein and is said to make one look beautiful. Wait, did I mention lye? Oh yeah, it’s that chemical being used in clearing drainage pipes, in batteries and as a chemical that kills plants. After the lye treatment, it is further saturated and soaked with cold water for five to six days in order to make it edible. Why it’s good: It’s actually available in the United States right now. Check your local grocery stores! Though you would want to stay away from the above mentioned dishes, trying them out at least once in your lifetime would make a great story. After all, your friends would get a kick out of you telling them a story about you eating a brain-dead octopus, right? Other weird dishes you should look up include balut, haggis, and fruit bat soup. Oh, and did I forget to mention bull’s testicles soup as well? Weird Coffees: They Put That Stuff in a Cup?? ?